Most people grow up and dream to pursue extraordinary feats. I, for example, wanted to be a professional pilot one day, just like my father. Unfortunately, most people are bound from doing so, perhaps because of a traditional upbringing that prevails still in our country, and hence end up stuck with more practical aims. 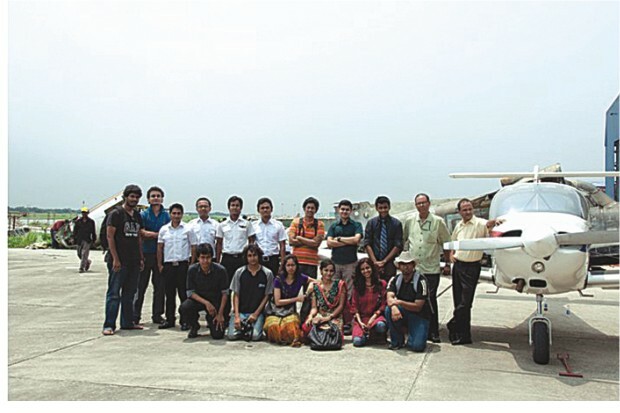 Even though many of us, in our journey to adulthood, stay away from the things we dream of, the members of English Club, North South University (NSU), found their long lost dreams and got the opportunity to visit the Bangladesh Flying Club on May 18, 2011. 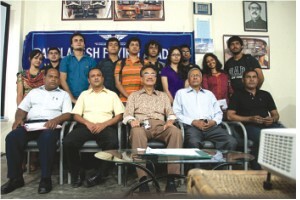 Members of NSU English Club at the Bangladesh Flying Academy, PHOTO CREDIT: Imam Hasan. The English Club members were given a heartfelt welcome by the President of the Bangladesh Flying Club, Captain Shahab Uddin Ahmed, Bir Uttam. Also present were Captain Syed Ali Asghar Rizvi, a legendary figure in Bangladesh aviation, having flown 17 different aircrafts in his lifetime, and Captain Ahmed, the Secretary General of the club. After being formally introduced to everyone, they were then taken to a classroom where an incredible reception by the staff members of the Flying Club awaited. As everyone took their seats, the Secretary General of the Flying Club gave a formal speech about the background of the Flying Club. He stated that they have highly skilled instructors who train students for their Private Pilot License (PPL) and Commercial Pilot License (CPL) which is recognised worldwide, also mentioning that most of the graduates of the Flying Club now fly the leading airliners around the world such as Emirates, Etihad and the likes. The President of the Club shared a few of his experiences from the liberation war which highly moved the students of NSU. A formal presentation followed, conducted by one of the students of the academy, who spoke about the benefits of flying and shared some fun facts that most of the members of the English Club were unaware of. The presentation ended with a small documentary video, explaining aerodynamics and the joys of being in the air with interviews from some distinguished flyers such as John Travolta, a famous actor and a pilot. One of the instructors of the Flying Club also took a small question and answer session where he answered questions regarding flying and aerodynamics. Students with the distinguished flyers. The day ended as the English Club members sat down once again with Captain Shahab Uddin Ahmed to discuss their own experiences and thoughts on visiting the esteemed institution. Above all, this was one of those once-in-a-million, rare days for the members of English Club, North South University, to take a peek into the lives of those extraordinary pilots who dare to fly beyond the familiar horizons. 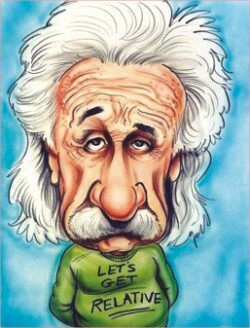 Albert Einstein was such a poor student that some of his teachers thought he might be mentally handicapped! By the age of nine he still didn't know how to speak fluently. But he was very fascinated by the laws of nature and fell into a deep wonder when puzzling over the invisible, yet real, force directing the needle of a compass. When he was only 12 years old he discovered Geometry (the study of points, lines, and surfaces) and was taken by its clear and certain proofs. Einstein mastered calculus (a form of higher mathematics used to solve problems in physics and engineering) by the time he was only 16 years old!